“What’s going to replace the Unicorn party trend?” Llamas, of course! Yes, Llamas are definitely dethroning the beloved Unicorn (but let’s keep those fat-sugar-induced-coma unicorn cakes around a little while longer). If you’re looking for llama birthday party ideas, you’ve come to the right place. Every party starts with an invitation and these are Llama approved! What’s so great about a Llama themed party is that it is suitable for so many things, a girl or boy birthday, retirement party or even a baby shower! Designed by yours truly at Party Treatment. I might be slightly biased, but I LOVE the fact that you can demo my designs before you buy. Plus, no waiting for proofs and you can download your choice of PDF or JPEG and make as many changes as you’d like in 30 days. Oh and use code ARROWANDBLISS1 for 20% off this llama invitation. I have fallen in LOVE, Soiree Love, that is. Dee, the beauty and brains behind Soiree Love, has created some awesome balloon packages, and luckily she’s got the Llamas covered. If your party has more of a fiesta flavor, she’s got cactus and fiesta packages as well. I just love finding new faves! Can’t wait to feature some of her stuff in my own parties and celebrations. If you’re having a themed party, you might as well dress the part. A personalized shirt for the birthday girl and Llama tribe member attire for the family (and super close friends). A llama pinata is only fitting as the essential party game! Get this one at Shindigz. This instant download Pin-the-Gift on the Llama is a great option. Love that it is available in different colors. If you’re on the hunt for llama themed baby shower printables check out this or this. When I think of Llama, I think of Mexico. Are Llamas indigenous to Mexico? (I’ll google it) Anyway, I then think of tacos. But at a party, kids are running around playing. You want something that’s grab and go, like these mini taco cups. For a pre-cake treat, cookies are a go-to for many, including us at Arrow and Bliss. These Llama cookies via Flour Box Bakery sure fit the bill. Don’t forget something sweet to wash down all the food. For a kids birthday party, you can’t go wrong with juice boxes or juice pouches. Luckily, I’ve created these juice pouch labels that fit perfectly on top of Capri Sun and Kool-aid jammers juice pouches. Available at Party Treatment. Nothing brings more excitement to kids at a party like bringing out a cool cake. These Llama cakes will definitely do just that! It’s amazing how a cake can create a whole new craze, but yet here we are. Stampers are always a favorite among younger children. In various colors these, by Tiny Mills, are sure to be a hit. Also consider Llama inspired water squirters, notepads for the stamp, and a favor box to put them in. These Llama fruit snack favors are too adorable. Yes, I am tooting my own horn a little bit. I personalize the front with name and age, print and seal a packaged bag of Welch’s fruit snacks inside. They make for a great party favor to go. While, I don’t have an actual play list you could use, I thought Luda could put a smile on your face and get you in a Llama partying mood as he puts a twist on a classic children’s story. 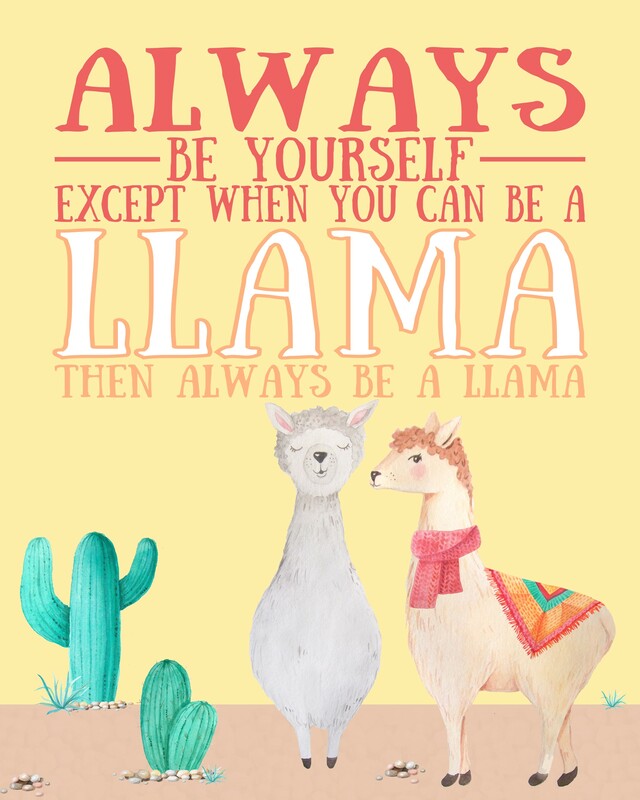 WANT YOUR FREE LLAMA 8×10 PRINTABLE? What a great idea for a llama party! Everything looks so adorable … if I had a daughter, I’d definitely organise this kind of party for her. Great pics! That is incredibly creative and a lot of hard work I assume. Wonderful! I love this idea about a Llama party! So cute and adorable. Perfect theme for any girl party! Oh my goodness! What a cute theme idea for a birthday party! I want to do it just for the cute llama cake and cookies! This is so cute. I know my daughters would love this. I think the llama is fun, too. This is such a cute theme. These ideas are great. Oh my gosh! I think MY next birthday party is going to be Llama themed after seeing this! Oooh My kids love the story llama, llama red pajama. A llama party could be so much fun! The llama cookies and cake 😍 I love it!